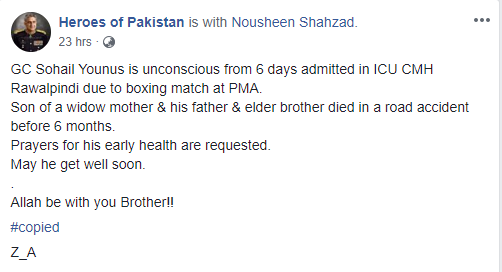 PMA Kakul's GC Sohail Yunus Has Been In Coma Since 6 Days After A Boxing Match Injury And Needs Your Prayers! Life is unpredictable. We really don’t know what is coming next to our life. We find this uncertainty a blessing when we receive good news but this godsend turns into an ill will upon receiving a difficulty. It’s all in Allah’s hands, He knows everything better than us! 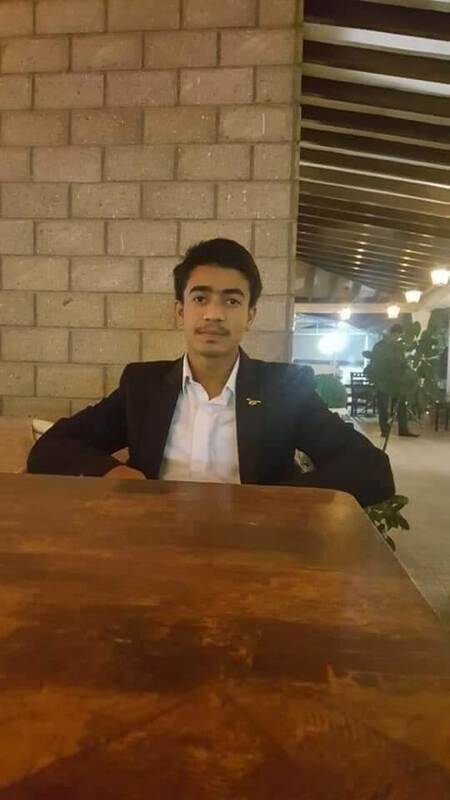 Sohail Younis, the young cadet of Pakistan Military Academy (PMA) met a horrible incident six days ago. According to details, Sohail was in the boxing ring and during the match, the opponent punched him and he fell down. 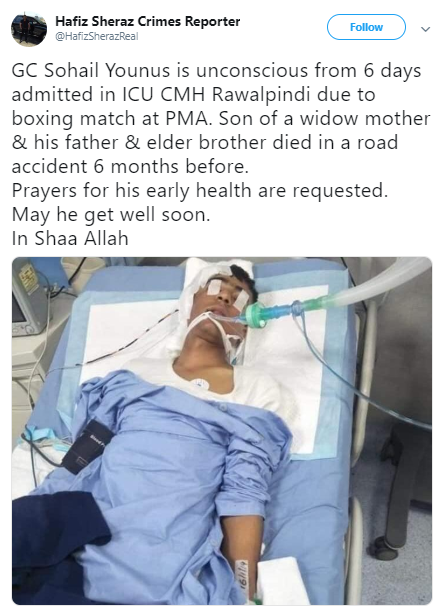 Sohail was shifted to CMH Rawalpindi for treatment and after the required first aid, the doctors kept him on the ventilator and from 16th January to till date he’s been breathing via a respirator. Sohail has lost his elder brother and father in a road accident six months ago, the widowed mother is the only inspiration of Sohail. Read The Complete Post Here! His Friends Are Asking People To Pray For Him! Opponent pagal tha khiska hua? Pakistan Military Academy (PMA) Kakul is an institution to provide training to young cadets. In the time span of two years, the academy has provided such an environment that every cadet develops attributes of courage, discipline, integrity, dignity, honor, and patriotism. With educational knowledge, PMA provides the best physical training as well. 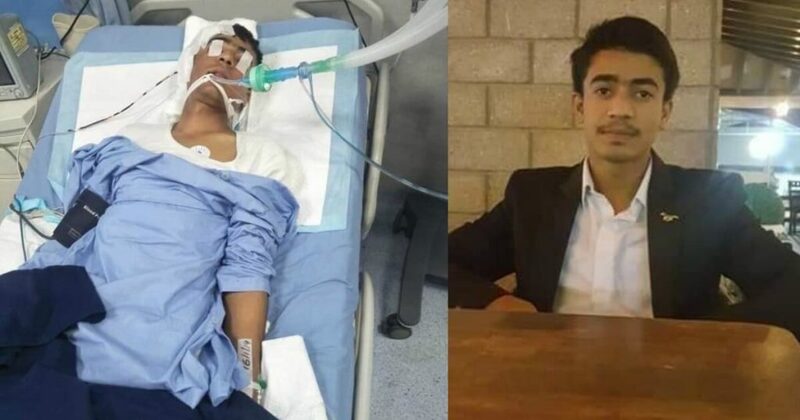 Sohail Younis needs your help and prayers both. Aen, saath mil ker, is post ko share keren and dua keren ke GC Sohail jald sehatyaab hojae. Ameen! JazakAllah!